I’m one of those weird people that actually likes the pie crust more than the filling. Especially when it’s this all-butter version. When I’m eating a slice, I usually get rid of that annoying fruit first and then enjoy my crust and ice cream. Most people don’t share my crust love, but they love crumble. 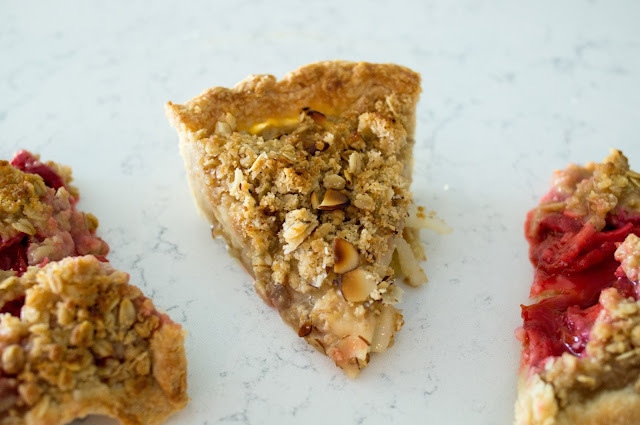 Enter the crumble pie. 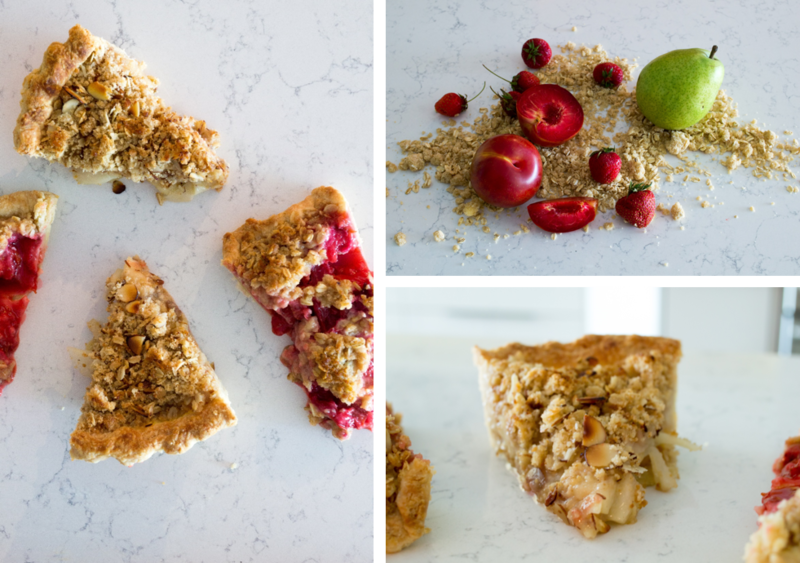 Part pie, part fruit crumble, it’s the best of both worlds. Another bonus: you get two pies out of one crust recipe because you don’t have to worry about top crusts! It’s easier, it’s delicious, and it results in more pie. 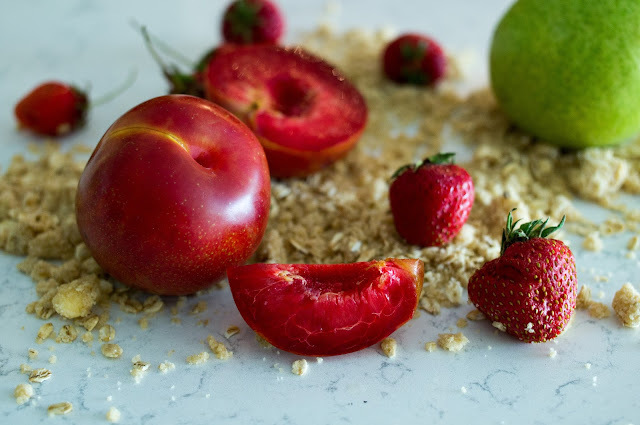 The point of this post is the crumble topping, but I couldn’t resist adding a few filling combos to inspire you. 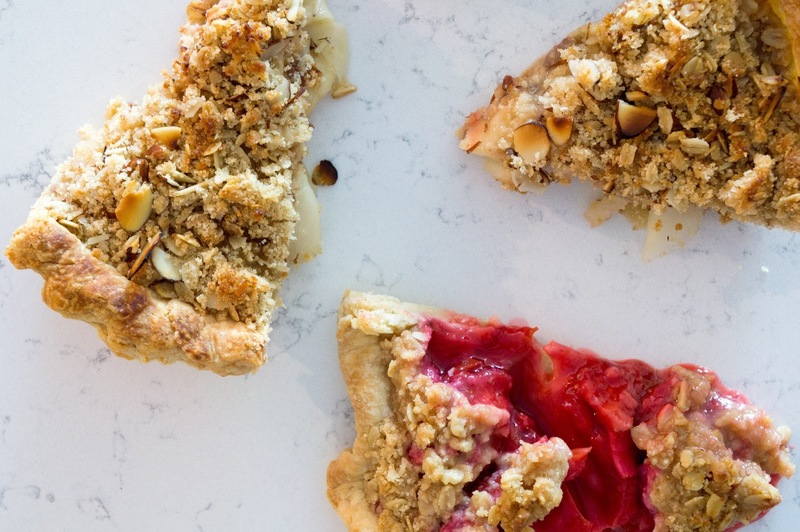 As we move through the season’s fruit, different pies will be more appropriate. I’m looking forward to turning this crumble into a crumble pie when peach season comes along. Whisk all ingredients together in a large bowl. Cut butter into pieces and toss with flour mixture. Using your fingers, rub butter into flour mixture until it forms a relatively uniform crumble with butter no larger than pea-sized pieces. Depending on the pie you’re making, stir in nuts, shredded coconut, or any other topping you can think of. 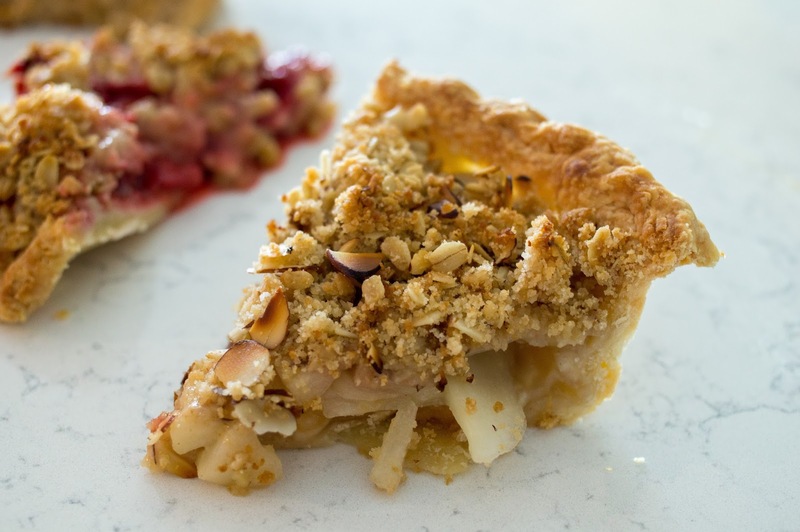 Combine all ingredients in a large bowl and pour into chilled pie crust. Top with crumble. Bake at 400F in the lower third of the oven for 20 minutes. Reduce heat to 350F. Bake another 40-50 minutes or until crust and topping are browned and filling is soft and bubbling. If the crust starts to brown too much, cover top of pie with foil. Cool to room temperature on a rack. Refrigerate for 4 hours or overnight to help the filling set. If your fruit was very juicy, it may still be quite liquidy. That’s ok, pie is meant to be delicious, not pretty. Slice and serve! Roll out marzipan so it fits in the bottom of the pie crust. Lay it in the bottom of the crust and chill while you prepare the filling. Bake at 400F in the lower third of the oven for 20 minutes. Reduce heat to 350F. Bake another 40-50 minutes or until crust and topping are browned and filling is soft and bubbling. If the crust or crumble starts to brown too much, cover top of pie with foil. I find the almonds in the topping burn fairly easily. Cool to room temperature on a rack. Refrigerate for 4 hours or overnight to help the filling set. Slice and serve!